From today, EU citizens in the UK must apply to stay in your homes. My message to Europeans in my constituency is, this is your home and you are welcome here. This is a difficult day for all EU citizens, and it is shaming that you must apply to remain our friends, colleagues, family, and community members. The Government has given reassurances for EU migrants in our country, and has made it clear how important it is to secure the rights of EU citizens in the UK so I will continue to pressure them to honour that assurance. The scheme will be fully open by 30 March 2019, so do not rush or panic. To make this process easier for my constituents, I have provided some vital information below to clear up any understandable confusion. Married to a British citizen and you’re from the EU. Providing proof of your relationship to your EU citizen family member (birth, marriage or civil partnership certificate). If your family member applies first, you’ll be able to link your applications to theirs using the application number your family member gets when they apply. 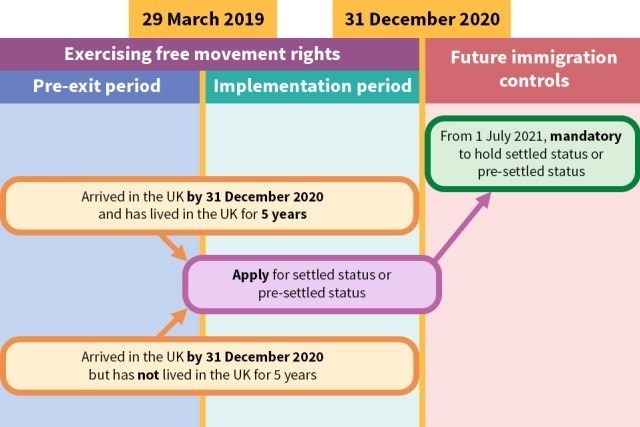 You should get settled status if you’ve lived in the UK for a 5 year continuous period, and have started living in the UK by December 31, 2020. If you’re an EU citizen living the UK, but has not been here for five continuous years, you will be given pre-settled status. This will allow you to stay here until that five year mark, and then you will need to claim settled status. You can stay in the UK for a further 5 years from the date you get pre-settled status, but you must apply again and get settled status if you want to stay longer. You’ll need to fill in a form online, via post or using the smartphone app. However, you’ll need an Android phone to use the app, but hopefully this will be resolved soon. I have heard many reports that scanning documents in takes a couple of tries, so don’t worry if it doesn’t work on the first go. Face-to-face assisted digital support will initially be available in 50 locations, but these will be increased to provide national coverage by 30 March 2019.